Is it really a “fossil” fuel? The phrase “fossil fuel” implies oil is a product of hundreds of millions of years of vegetation and animal decay. Oil becomes proof of the theory of evolution. It is further argued that since oil is a fossil fuel, there is a limited amount and once it’s gone, it is gone. However, this theory took a major hit on January 14, 2005. 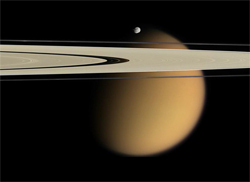 That was the day, the Cassini-Huygens satellite scanned Titan, a moon of Saturn, and found massive quantities methane — literally lakes of methane. The Cassini-Huygens satellite is a joint venture sponsored by NASA, the European Space Agency and the Italian Space Agency. It has been scanning Saturn and its moons since its arrival in this part of space in 2004. Titan is the second largest moon in our solar system and with a radius of 1,600 miles (2,754 kms) is larger than Mercury. Methane is an odourless gas released in the decay of organic material. Oil is created when methane percolating up through the earth’s crust is heated then cooled resulting in the condensation of certain hydrocarbons producing oil. It is believed to be the source of Earth’s oil. However, the discovery of methane on a lifeless moon meant it could also be created through non-biological processes. After studying their findings, NASA released a report in December 2005 stating Titan’s methane was not biological and was created through geological processes deep within the interior of the moon. It was a stunning revelation. The results were published in Nature Magazine. However, this announcement was not shocking to Thomas Gold who wrote a book entitled The Deep Hot Biosphere: The Myth of fossil fuels. Since Methane could be created from non-biological materials in laboratories, Gold argued Earth’s methane was being created within the earth’s core and not from organic decay. Titan was now the proof of his theory. At the time he wrote the book, Thomas Gold was professor Emeritus at Cornell University in Ithaca, New York. Oil created from non-biological sources is referred to a abiotic oil. There has been evidence of non-fossil based methane on earth for some time. In his article, “It’s No Crude Joke: This Oil Field Grows Even as It’s Tapped,” published in the Wall Street Journal, Chris Cooper points to the mysterious case of Eugene 330. Eugene Island — located in the Gulf of Mexico about 80 miles off the coast of Louisiana — is the protruding tip of a large, submerged mountain. Naturally forming vents on the side of this mountain spew out natural gas. Since both natural gas and oil are produced from methane, they are often found together. The search for oil began. In the 1960s, a huge reservoir of oil was discovered near the mountain. This led to the construction of an oil platform called Eugene 330, which started pumping oil in 1970 at the rate of 15,000 barrels of day. By the 1980s, the oil reservoir was shrinking and production declined to 4,000 barrels a day. Then during the 1990s — almost overnight — oil production surged back to 13,000 barrels a day. This development immediately caught everyone’s attention and eventually led to the equivalent of MRI scan of the reservoir. The scan revealed oil gushing in from a crack at the bottom of the reservoir. It was coming from deep within the earth’s core and below where methane could be made from organic material. But this reservoir is not the only one refilling. Other fields are replenishing in the Gulf of Mexico, Uzbekistan and even Alaska. Then there are the Middle East oil fields, which have been producing oil for decades. Despite minimal discovery of new oil reserves in the area, Middle East nations claim their oil reserves have doubled over the past 20 years. Norman Hayne, a professor at the University of Tulsa in Oklahoma suggests the Middle East wells may be refilling as well. Increasing oil consumption, increasing reserves? In addition, oil companies are now finding oil deposits in bedrock, far below the sedimentary rock where the fossil fuel evolutionist says it was produced from decaying dinosaur bones. Some suggest that we may have just pricked the surface of the known oil reserves. According to the US Department of Energy there is now 1.28 trillion barrels of proven oil reserves. This means that despite decades of consumption, the amount of oil available for human use is at its highest point in human history. But it is also disturbing the comfortable theories of evolutionists who have used oil as yet another evidence of an old earth and evolution. In fact, if oil is a naturally occurring chemical in the earth’s core, it would appear that God intended it for our benefit and use.